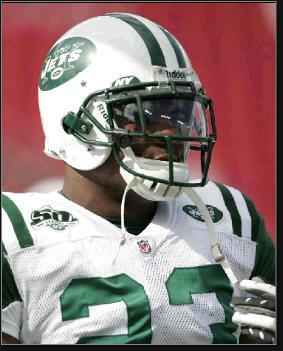 Shonn Greene was born August 21, 1985 in Sciklerville, a small town south of Camden off the Atlantic City Expressway. Shonn was the eldest of six children. Shonnece, Shonte, Shonreke, Shonray and Shontray followed. Shonn was a quiet boy who loved football. When he was seven, he confided in his father, Reggie, that he planned to play in the NFL. After Shonn turned 13, his parents separated. He moved with his father and five siblings into the home of his grandparents, Cheryl and Eulist. Shonn attended Winslow Township High School and became the star of the Eagles football team. Among his teammates was Jeromy Miles, who went on to play for the Cincinnati Bengals. Another star athlete for the Eagles was wrestler Jordan Burroughs, who won a gold medal at the 2012 Olympics. Shonn ran for 1,267 yards and scored 18 touchdowns as a junior, and 1,378 yards and 16 touchdowns as a senior. He earned all-conference and all-state honors both seasons. Shonn was recruited by several top college programs, but his academics fell short of minimum standards. He attended a “fifth year” of high school at Milford Academy in Connecticut and raised his test scores enough to earn a scholarship to the University of Iowa. Shonn played the 2005 and 2006 seasons for Iowa, but left the school after his sophomore year because of academic difficulties. He spent 2007 at a local community college, and returned for his junior year in 2008. And what a year it was. Shonn racked up 1,850 yards in 13 games for the Hawkeyes, won the Doak Walker Award as the nation’s top running back and was named Big Ten Offensive Player of the Year. He was All-Big Ten and a unanimous All-American, and was named MVP of the Outback Bowl in his final college game. Shonn was the only player in the nation to top 100 yards in every game he played. Although he had one more year of college eligibility, Shonn decided to enter the NFL Draft. The Jets targeted Shonn and traded up 12 spots to get him in the third round. Shonn spent his rookie year as the backup to Thomas Jones. He gained 540 yards, including a 144-game against the Raiders. Shonn was the star of the team’s two playoff victories, with 135 yards over the Bengals and 128 yards against the Chargers. Shonn shared the backfield with LaDainian Tomlinson in 2010 and finished the year with 766 yards as the Jets made the playoffs again. He ran for 70 and 76 yards in wins over the Colts and Patriots. Shonn became the team’s starter in 2011 and cracked the 1,000-yard mark with 1,054 yards and 6 touchdowns. He also caught 30 passes. Shonn was the backfield workhorse for the Jets again in 2012. He enjoyed the best game of his career in an October win over Andrew Luck and the Colts. Shonn piled up 161 yards and scored three touchdowns.He finished the season with 1,063 yards and 8 touchdowns. Shonn became a free agent after the 2012 season and signed a $10 million deal with the Tennessee Titans. He served as a backup to Chris Johnson in 2013 and then took over the starting job in 2014 after Johnson signed with his old team, the Jets. Shonn ended up splitting time in the backfield with rookie Bishop Sankey and gained 392 yards in 13 games.